This feature allows you to share your Local/Home WiFi networks with your Skype Contacts so that they can access & connect to your WiFi faster.The feature broadcasts passwords & auth stuff to the contacts near you,so their PCs connect automatically to your WiFi. A feature which we personally regard as useless this could potentially exploited by a person with wrong intention to gain access to your connected devices without even you knowing it. 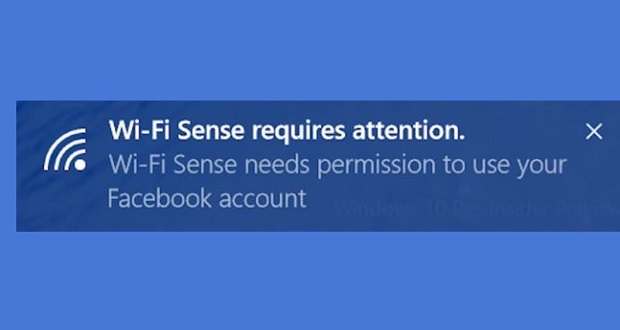 Recently,WiFi Sense controversially added Facebook Login support,which means that all your Facebook Friends will get access to your WiFi when they’re in range. It’s better to disable this feature to protect your privacy.We’ll see how to disable the feature. Open Settings from your Windows 10 PC,choose Network & Internet—>Select WiFi & then on WiFi Sense.Then turn off every feature listed in it one by one.There you go.You can also rename your WiFi network to add ‘_optout’ at the end of its name, as suggested by BGR.Doing this will disable the WiFi sharing for that particular WiFi network. GodMode is a collection of useful features combined in a single menu.It’s easy to find the settings once GodMode option has been activated.This is for the advanced users to play with some features that are hidden deep inside the Control Panel. You’ll observe that the folder icon has been changed to Control Panel’s icon & GodMode option is activated.Browse through the settings & tweak them as you wish. As you all know,Cortana is Windows 10’s Voice activated AI assistant.It helps to set reminders,alarms,keep track on deadlines,fetch flight info & search apps & the web,right from the Start Menu. By default,Cortana uses Bing AI engine to deliver search results & make searches on the internet.But you can now force Cortana to use Google search.Simply install Chrometana extension for Google Chrome or Install Firefox & set it as default browser,instead of Microsoft Edge. This will force cortana to perform searches using Google. Bash is not a Linux specific shell anymore! If you love Linux & has the habit of performing operations using Bash commands,this feature is for you.Canonical’s efforts to persuade Microsoft to add Bash support on Windows 10 has finally answered. But the feature will be disabled by default.To enable it,open control Panel & select Programs & Features.From there,select Turn Windows features on or off. From long list,check the option that reads ‘Windows Subsystem for Linux(Beta).Now apply & reboot the system.There you go.Bash & its supporting features are enabled. Now double-click on the shortcut & you’ll see the pull down shade prompting you to slide down to shutdown your PC.Simply swipe from the arrow to power off your machine.Cool Huh? Another nifty feature of Windows 10 is Shake to Minimize.Having too much windows open while multitasking & suddenly you want to clear them all at once,what to do? Select each window & press on Minimize,right? Now you can minimize all windows in one go.Just grab the active window which you’re working on & shake it.All the other windows will be automatically minimized. Try these features & comment if you found this interesting.